Pakistan was made in the name of Islam’ is the first thing you’ll hear when you suggest a secular government. They’re not wrong. The eggs that were laid in 1947 cannot be unhatched, and we’re not being forced to work with what we have. ’ll start by painting my picture of an ideal Pakistan. Pardon me if it does not agree with your own. An ideal Pakistan is one where all people, irrespective of their religious beliefs, are free and equal. No religious group or sect holds dominion over the other. No religious group profits politically through special privileges in making and enforcing laws. There is no faith-based apartheid. The white and the green stand as one under one law. That’s secularism. To install Islam as the state religion is to claim moral superiority above all else who, like you, make this country strong. It’s you telling a Christian cadet that you’re better than him. It’s you telling your Hindu colleague that you’re better than him. It’s you telling your fellow non-Muslim Pakistani that you have a right to hold the keys to his house, and make decisions on his behalf. ‘Because Pakistan was made in the name of Islam’, and millions of non-Muslims are accidental passengers on your boat; hunkered in the lower decks while you steer our collective fate from an all-Muslim bridge. That is fine. This is what we have “democratically” chosen to believe. Two lions and a goat have each cast their vote on what to have for dinner. Who am I argue with the majority? 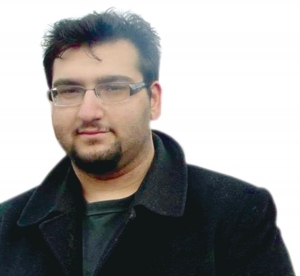 To put it in a different way, who am I and my secular comrades – all remaining six of them — to stand against 60 years of state-sponsored Islamo-nationalist opinion-making; the successful weaponisation of religion and brick-by-brick construction of the twin towers of mullahism and militarism? 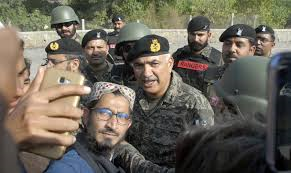 Consider Exhibit A: the viral selfie of a contented youngster – ostensibly an activist or supporter of the Islamist organisation TLYR – with Major-General Azhar Naveed. This selfie is the culmination of decades of radical pro-Islamist state policy. The camera phone did not capture one moment in time, but a sixty-year marriage of nationalism and religious fundamentalism, made possible by powerful interests. If you zoom in close enough, you may spot Zulfiqar Ali Bhutto in the selfie, peering bashfully over the major-general’s shoulder; capitulating to the combined pressures of internal Islamist groups and the Saudi establishment. If you digitally enhance the background, you may spot General Zia ul Haq’s face emerging from the bushes, beaming broadly at the alliance before him. If you look at the selfie from a certain angle, you might even find a holographic representation of the Punjab University’s vice chancellor being forced to resign, after being pressured by the Punjab government to handover two-kanals of university land for construction of a madrassa. Whoever assumed that the selfie is nothing more than a mildly amusing cross-sectional image of our political climate, rather than a longitudinal collage of pro-extremist state policies, may need to look again. To reiterate, who am I with my anaemic endorsement of secularism, to push this extremist Tsunami back into the sea? This is a wave that has not only swept the living off their feet, but the dead along with it. Jinnah – a socially liberal, , dog-owning, British-educated, lawyer – was resurrected as a devout Sunni Muslim icon. Iqbal – the Nietzsche-inspired, ‘Hindustan’-loving poet, who warned of devils clad in ehram – was euthanised and returned as a staunchly Islamic partition theorist. This isn’t defeatism. These are all questions that we ask ourselves when building a practical political movement, rather than arguing what is theoretically fairest. This is where we learn that practical activism isn’t simply about raising our voices, but maintaining strategic silence where required. An underfunded, underheard secular movement is destined to generate little more than martyrs. But the readymade wave of Islamisation may well be surfed by the political left. It should be noted that religious equality is merely one part of a larger war against inequality that we’re engaged in. Class inequality remains the fountainhead of all injustice. It is, in fact, the only quantifiable form of inequality. He whose bank account is twice the size of yours, is twice as privileged as you. The left must, within reasonable limits and without exacerbating religious extremism, be able to speak the language of the masses. We must not embrace that which violates our principles of liberty and equality, but we could be expected to steer the wave of Islamisation, and ram it straight into the gates of the plutocrats; those who sow the seeds of religious, sectarian, patriarchal, and class discord from their seemingly impenetrable gated communities. I think Pakistan needs to have Islam as a political system instead of man-made democracy which is unquestionably failing the country. Under the Islamic system Christians, Jews, Hindus and Sikhs etc.. will all be protected and so will there places of worship. In fact under an Islamic system they’re allowed there own courts to deal with personal and religious issues. The Khilafah (Islamic state) is not allowed to discriminate against its citizens on the basis of race, colour or creed.The Prophet (SAW) Said: “He who harms a person under covenant or charged him more than he can. i will argue against him on the day of Judgement”.